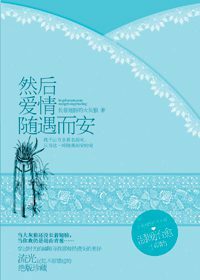 There are 5 books on the 6 sworn brothers in a serial called streamer (流光系列). ‘They are rich, handsome and powerful. These book are on various types of love as well as on the bond and mateship between the brothers. Book on youngest 6th brother. Chen Yu Bai (3rd brother) & An Xiao Yi – Chen Yu Bai is a sharp, domineering & cool man whereas An Xiao Yi is a foolish, childish & innocent girl. He is her boss & she is his secretary. He bullies her yet at the same time will not hestitate to protect & shelter her. Thus, she can always rely on him. Their relationship is a funny one on how opposite attracts. Li Wei Ran (5th brother) & Qin Sang – Li Wei Ran and his cousin Qin Song fell in long with Sang Sang who is An Xiao Yi’s best friend. Sang Sang sees Li Wei Ran as a good man. He is polite, patient and passionate whereas she is independent, intelligent and interesting. They are a perfect pair but she is afraid to love so he has to work hard to convince her he is worthy of her love..
Short sequel on their children.